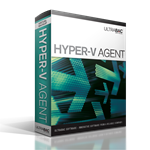 The Hyper-V Agent is available for purchase with UltraBac or UBDR Gold. This option performs centralized virtual machine backups without the disruption and overhead of running backup tasks from inside each VM. With just a couple of clicks, users have the ability to choose which disks to back up. Unlike competitive products, the Hyper-V Agent also has the exclusive ability to back up only used space, even for fixed disks. Since less data is being backed up the process is faster and it saves on storage space too. Another unique time and space saving feature is the ability to skip backing up pagefile.sys & hiberfil.sys files. For a more comprehensive overview, please view the Hyper-V Agent Product Sheet.